Palit presents three GeForce GTX 650 Ti graphics cards. It includes a reference based model with 928MHz core and 1GB GDDR5 memory clocked at 5400MHz, a 1GB OC edition with 1006MHz core and 5500MHz memory, and a 2GB version with 928MHz core and 5400MHz memory. Palit optimized the hardware design for GTX650Ti, using high efficiency PWM with super low RDS(on) MOSFET to lower heat generation and ensure enough energy supply for GTX 650 Ti.. Adopted with Solid Capacitors and High quality ferrite core chokes to make sure GTX 650 Ti running reliable under heavy loading and generating less noise. Equipped with the Turbofan blade design, it offers the optimized airflow to efficiently cool down the heat generated from GPU and also can provide a noiseless environment when under gaming mode. The Palit optimized hardware design can make GeForce GTX650Ti more reliable and have a lot of room for overclocking. 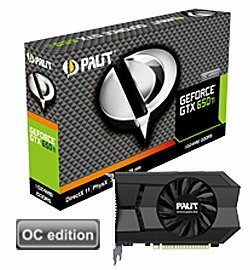 Palit provides 3 sku of GTX 650Ti for gamers who have different need. The Palit GTX 650Ti, the overall gaming performance is 20% higher than the competition HD7770 and the power efficiency rate is 50% better than the previous generation (GTX560). The Palit GTX 650 Ti OC Edition is even better, featuring 78MHz higher core clock at 1006MHz and performs up to 7% benchmark than non-OC GTX650Ti. With the latest Kepler architecture, it brings the higher graphics performance with lower power consumption. Save your money, save the environment and stay tuned with your game.